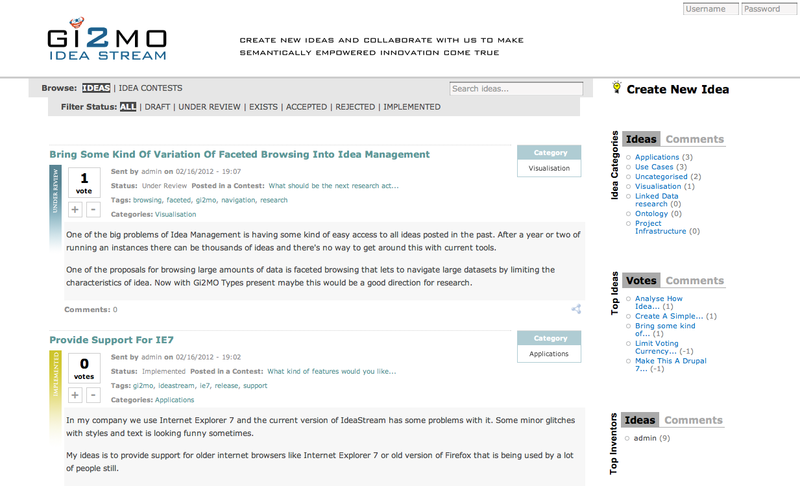 GI2MO Project Homepage » Gi2MO IdeaStream v0.1.5 released, improved support for Idea Contests! Gi2MO IdeaStream v0.1.5 released, improved support for Idea Contests! 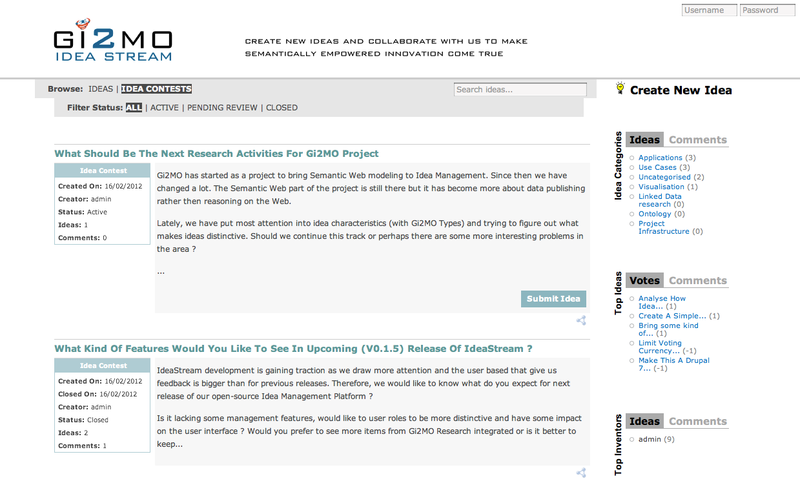 Most of the recent Gi2MO progress was focused on research activities, now we have something more development oriented to announce: a new version of our open-source Idea Management System, Gi2MO IdeaStream! Normally, we would just bump the version without any news posts but this time the update is quite considerable and its most important part is: Idea Contests. Contests play an important role in Idea Management ecosystem. They are focus sessions where organizers invite innovators to collaborate on particular topics and within a given timeframe. We already started to bring some attention to this topic in previous version of IdeaStream (v0.1.4 added private contests) but this time we focused more on the user interface changes and visibility of the contests. In the new IdeaStream version, the top bar for filtering has been remodeled to bring more attention to contests from the very start. Now, it allows to choose between browsing ideas or contests, as well as change filtering options depending on what is currently displayed. Gi2MO IdeaStream: New navigation bar (click to enlarge). 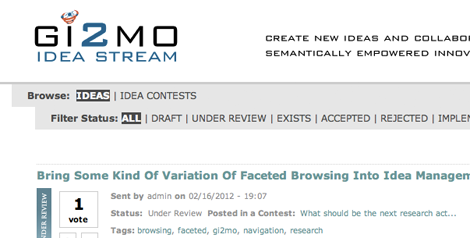 In addition, the idea contests have a new theme that displays some basic stats and aggregates the submitted ideas. Also, Idea Contests are now supplied with a workflow status that allows to close or open them for submission of new ideas. Gi2MO IdeaStream: New Idea Contests snippets and contest listing (click to enlarge). The other elements of the interface have also been updated to reflect the changes with contests, for example idea snippets now display information about the associated contest. Gi2MO IdeaStream: New idea snippets. Aside of the highlighted changes there are lots of minor additions and bug fixes, for details see the changelog in the install.txt file. If you wish to test IdeaStream v0.1.5 in action head over to the IdeaStream apps section to download the newest release. Note: If you are not doing a fresh installation and just updating from an older IdeaStream version to the new one, make sure to run the [your ideastream url]/update.php , it allows the module to make some important changes that allow the new version to work correctly. Also, remember to backup your data before proceeding with the upgrade.